glory be, look at those buns. And the glaze is pretty simple and all kinds of awesome. Steep Chai tea bags in buttermilk and butter, then add sugar and maple syrup and bring it all to a boil. It might get foamy and crazy, but keep stirring, you are on the right path. After five minutes, you have something that looks like this. And it's awesome. Invert your warm cinnamon buns onto a platter and pour the glaze over, then dig in. And share these, please. I packed up a bunch for my mom, so she could see what the fuss is about. And not wanting to have more than a couple in the house, I froze the rest, for those days when only a perfectly gooey, scrumptious, pumpkin cinnamon bun will do. With a cup of steamy tea, and a blanket and maybe a kitty, these cinnamon buns will pump you into your happy place. Let's linger there, shall we? To make the dough: butter a 10 inch round baking dish. Set aside. In the bowl of a mixer, using the paddle attachment, mix the flour, sugars, yeast, salt, and spices on medium speed. Add the butter and mix until incorporated. Add milk, cream and egg and mix on low until incorporated. Add the pumpkin puree and mix on medium speed for 3 minutes. Dough will be light orange and feel pretty soft and sticky. Remove dough from bowl and form into ball, placing it in a lightly greased large bowl. Cover with plastic wrap and let it rise for one hour in a warm place. Meanwhile, make the filling: stir together sugars and spices and salt, then stir in 1/4 cup melted butter. To assemble the rolls: once dough has risen for one hour, roll it out on a lightly floured work surface, into a large rectangle, approximately 20" by 10". Brush dough with 2 tbsp melted butter, then sprinkle with your filling mixture, leaving a 1/4' border around the edges. Use the palms of your hands to lightly press the filling into the dough. Starting with the long end, roll the dough up tightly and place it seam side down. Cut into 10 2" pieces and place in the greased baking dish. Cover with plastic wrap and let rise another hour. Preheat oven to 375*F and arrange the rack to the centre position. Bake for 25-30 minutes, or until tops of buns are golden brown. While the buns are baking, make your glaze: In a small, deep saucepan, melt the butter and buttermilk together on low heat. Turn off heat and steep the Chai tea bags for 15 minutes. Remove bags, squeeze out tea into the buttermilk. Add the sugar, maple syrup and baking soda, stirring well and bring to a boil over medium high heat. Let the mixture boil for 5 minutes, stirring often. It will be quite foamy, and that's normal. When it's a nice dark amber, or 5 minutes, turn off heat, and stir in the vanilla. Set it aside, let it cool a bit. When buns have finished baking, invert onto serving platter, and pour the warm glaze over. Buns are best when warm, and eaten that day or the next. They freeze well too. Makes 10 buns. Glory Be Indeed! 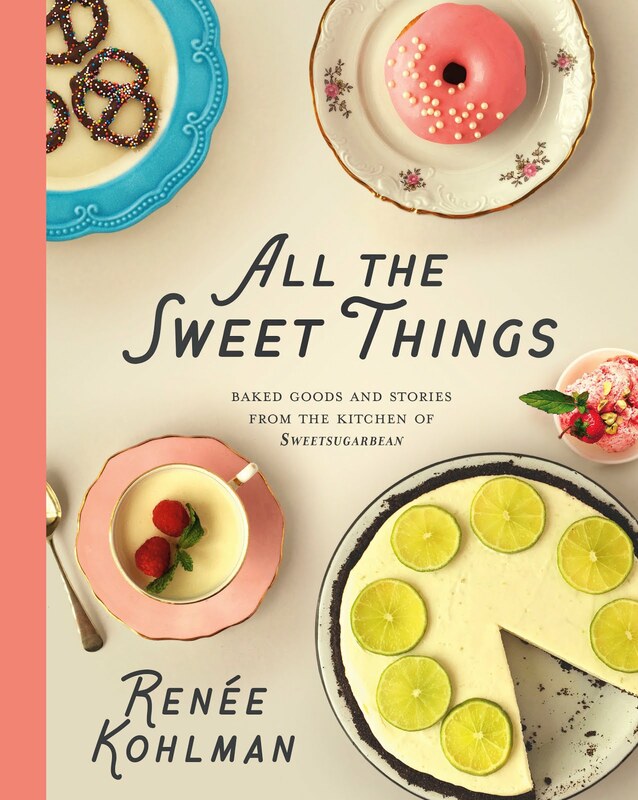 These look amazing and I can imagine how delicious your kitchen smelled while these were baking! Sweet baby Jesus, these look good! During this time of year I cannot get enough pumpkin- keep it coming, Renee! I do love cinnamon buns and this recipe looks so good. Who tires of pumpkin? Puh-lease. 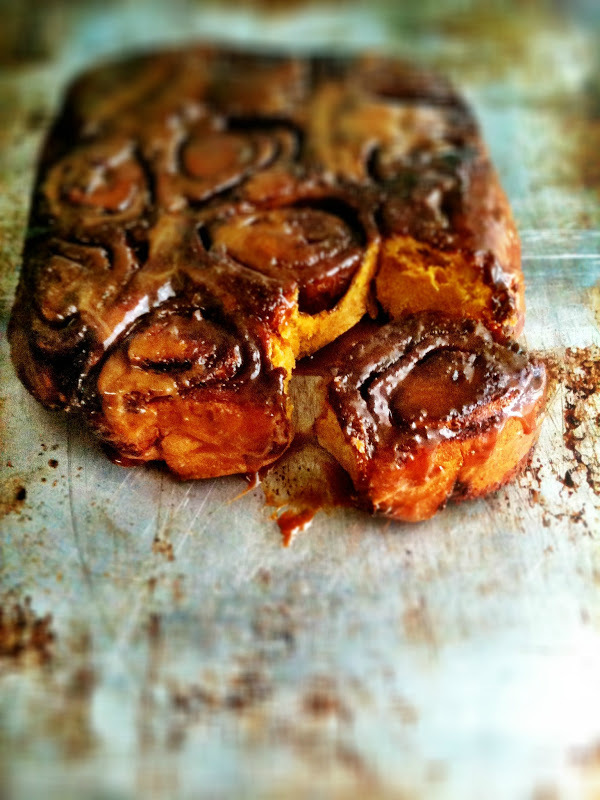 Pumpkin cinnamon buns are right up my alley and that glaze sounds to die for. Love the chai tea/buttermilk twist. I'll bet it really added a kick. Stay warm! love, love, love chai....that glaze looks magnificent! And so....did your mom love them as well? omg.. those look so so good. I want pumpkin everything right now (tis the season) but I especially want these!!! Thank you so much everyone! Candus, my mom did love these buns, and she knows her cinnamon buns :) Thanks for asking! ohhhhhhhhhhhh... MY! that glaze! I think I might make that and just pour it on everything. If you're freezing them, do you put the glaze on beforehand? Melissa, yes, go ahead and put the glaze on the buns as in the recipe. Freeze them just like that. I defrosted some just today, and wrapped them in tin foil to reheat and they were just as good as the day I made them. Yumma!